My current World of Warcraft character, a scuzzy-looking Void Elf Mage, looks out at the burning remnants of the World Tree, Teldrassil. I started playing World of Warcraft in about 2006, and it’s a testament to the allure of its world—the fantastical war-laden realm of Azeroth—that I’m still playing it 12 years later. In that time, the world of Warcraft has changed so much. And now, ahead if its latest expansion, one big change to that world is tearing me up inside. World of Warcraft has been kept alive for 14 years by its expansions, and its seventh (! ), Battle for Azeroth, is set to come out in two weeks. Warcraft revolves around the story of two often opposing factions—the Alliance and the Horde—as they tussle with each other to eke out a living on the often tumultuous world of Azeroth. While recent expansions have seen existential threats that have brought the Alliance and Horde together as wary allies (the most recent, Legion, saw them working together to stop a demonic invasion years in the making of Warcraft’s decades-old lore), Battle of Azeroth is being hailed as a return to the classic Warcraft-ian ideals of the Alliance vs. Horde conflict that drove the original strategy games in the series. Right now, to celebrate the impending arrival of Battle for Azeroth, WoW players can participate in a questline called the “War of Thorns.” Its focus is the inciting event that reignites the battle between the two factions—the Horde’s siege on, and eventual destruction of, the ancestral home of the Alliance’s Night Elves, a giant tree off of the coast of the western continent of Kalimdor called Teldrassil. 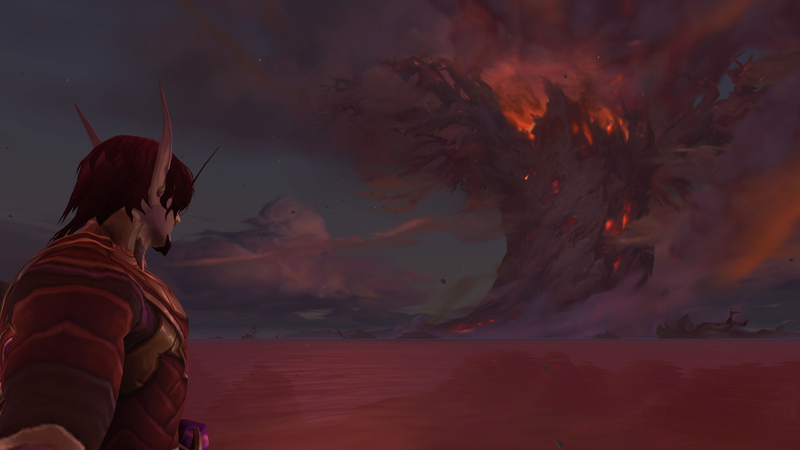 The destruction of Teldrassil has been known about for a while, but since the conclusion of the storyline went live on the game’s servers this week, World of Warcraft’s fandom has been...let’s say very divided about the way this part of the story has played out. Especially in its characterization of the Horde’s current leader, the undead ranger Sylvanas Windrunner, who has been a beloved and prominent figure in Warcraft’s story since the franchise’s early days as a real-time-strategy series. And also because of, you know, the fact that basically half of the player base has been dragged into committing a pretty terrible act of war(craft), whether they wanted to or not. But while WoW players are busy arguing for and against this latest chapter in the game’s 14-year-long story, I’ve found myself weirdly more upset about Teldrassil’s destruction than I probably should be about a location in a video game. Teldrassil isn’t just an important place in the game’s lore to me; it’s the first part of Azeroth I ever visited in World of Warcraft. When I was a spry teenager all the way back in 2006, the very first character I made to play World of Warcraft with was a Night Elf Druid (I like elves, and I like elves that cast magic; this is a fantasy trope that I have yet to grow out of almost a decade and a half later, although I’ve long since stopped playing that Druid). I had no idea what I was doing because those weren’t really the days when you could go look up guides for optimal gear or ability rotations—but I was loving every second of this weird and wonderful game nonetheless, enchanted by the mystical forests and darkly-lit purple hues of Teldrassil’s environments. The first sight new Night Elf characters ever see when they begin their World of Warcraft journey: Aldrassil, a small town on Teldrassil that is basically a large tree on top of an even larger tree. That curiosity of exploration would turn to love pretty quickly, and despite subscription lapses here and there, the enchantment I felt spending hours wandering through that digital space—fighting off giant spiders and angry bear-like creatures called Furbolgs, before finally making my way to the grand structures of the Night Elf capital city, Darnassus—cemented what has become an enduring adoration for Warcraft’s world and story. Even though my many WoW characters (yes, a lot of them Night Elves) in the years since have traveled well beyond Teldrassil’s roots and onwards to new adventures, I’ve always found myself coming back, just to enjoy the atmosphere and its quietness, huddled away from the bustle and noise of WoW’s bigger, busier cities like Stormwind or Orgrimmar. But now that this chapter in WoW’s story has progressed, my characters who go through the “War of Thorns” can’t go back. Teldrassil is gone—my mages attempting to use their teleport spells are unceremoniously dumped on the shores of Kalimdor instead. On flying mounts, an invisible wall eventually bars you from getting close to what is now the smoldering ruins of the tree. All you can do is watch as it quietly continues to burn. This is about as close you can get to Teldrassil after you complete the storyline, which actually rewards you with the Hippogryph my character is riding. Always accessorize when attending your next giant tree burning! The version of Teldrassil that existed before it was all toasty isn’t actually being removed from the game altogether of course—that would be truly insane. It’s a rarity that the developers, Blizzard Entertainment, actually permanently remove parts of Azeroth from World of Warcraft altogether. The biggest exception to this would be the sweeping changes the 2010 expansion (Cataclysm) brought to the two main continents of Warcraft, Kalimdor and the Eastern Kingdoms, completely reworking the designs and narratives of zones that had been in the game since the very beginning. As with other areas of the game that have been affected by major moments in Warcraft’s overall narrative, there will be tools—dressed up within the fiction as the influence of the timeline-controlling Bronze Dragonflight flinging you back into the past—to allow players to revisit the zone as it was before the events of Battle for Azeroth. I could visit Teldrassil any time I wanted, with the press of a button. It’d be like looking back at a photograph—a point in time trapped in a bubble to remember it by, but you can’t actually go back to those memories and re-experience them. I can kid myself all I want walking around the Teldrassil of the past that I’d spent days, maybe even actual weeks, of my life in (those dungeon queues could take a while, and I always liked the atmosphere there while I waited for them). But the minute I step out of that bubble, the minute I let the story continue, it once again turns to smoldering ashes, and those old memories I have are all that can remain. My current WoW main logging out of Darnassus for one last time before it got set on fire. I realize that this outpouring of melancholy is all a bit silly—I’ve never actually visited this place, I’ve just run a bundle of polygons around inside another bundle of polygons, in a video game about magic and monsters and other fantastical, not-real things. Darnassus isn’t really mine, it belongs to me and the millions of other players who’ve likewise trudged digital avatars through it for years and years. But the worlds created by the fiction we love most, regardless of medium, have the power to transport us to places unlike anything we can experience in our actual lives. The interactive quality of the worlds in video games, in particular, have a power beyond other mediums to root us in those fantasies even more deeply, to feel connections to these worlds that are made even more personal by directly placing the player within them. World of Warcraft’s 14-year history—a living history that’s grown and expanded and evolved, all while being witnessed by a community of millions who are living it out together—carves out a niche for itself that pushes those personal connections even deeper than almost any other game can claim to. There’s nothing really quite like World of Warcraft, in that way. It’s why, when I finished the storyline that culminates with Teldrassil’s burning, I couldn’t help but feel weirdly like I’d lost something that’s been part of my “real” life. Stand As One—For the Alliance!